The National Electric Code, section 690.15, requires PV arrays to have a disconnecting means to isolate the inverter from the PV power source. Utility grid-tie inverters that utilize PV arrays with voltages above 250 VDC require a 600 VDC rated disconnect to perform this function. For inverters that do not include a DC disconnect, one of these can be used. The Square-D 600 VDC 30, 60, and 100 A 3-pole safety switches are rated by the factory to handle one 600 VDC circuit per pole. 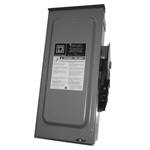 The 30 A switch is rated for 15 A Isc for non-fused and 12.8 A Isc for fused. The 60 A switch is rated for 48 A Isc for non-fused and 38 A Isc for fused. The 100 A switch is rated for 80 A Isc for non-fused and 64 A Isc for fused. 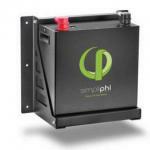 They can be used for disconnecting up to 3 PV arrays for 3 grid-tie inverters. All of the Square-D 600 VDC disconnects are rated for disconnecting one circuit at full rated power using 2 poles in series. Many utilities require an AC disconnect between a grid-tie inverter and the AC load center, close to the AC service entrance, and with a visible and lockable handle. 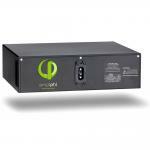 A 30 A /240 V disconnect works for up to 5 kW at 240 VAC and the 60 A disconnect works for up to 11 kW. Use an AC load center to connect multiple inverters to a single disconnect. The breakers can be back-fed with the inverter outputs and the load center main lugs will handle the combined outputs to be connected to the AC disconnect. Use Class R fuses of the proper voltage and amperage for fused disconnects. 600 V fuses will not fit into 240 V disconnects, and 250 VAC/125 VDC fuses will not fit into 600 V disconnects. ¹ Uses 2 poles in series for 600VDC, except as a PV disconnect, where all 3 poles may be each be used for 600VDC at full amp rating. ² Uses 2 poles in series for 600 VDC, except as a PV disconnect, where all 3 poles may each be used for 600 VDC at full amp rating. ³ Uses 2 poles (and 2 fuses) in series for 600VDC. ¹ Switches are rated for 250VDC but available fuses are only rated for 125VDC. These conduit hubs connect conduit or a kWh meter socket to the top of the disconnect. The neutral and ground busbars are used to land these conductors in the disconnect switch box. Appropriate busbars for each disconnect are identified in the tables above.